Unilever is the world's biggest ice cream manufacturer, with an annual turnover of €5 billion. With the exception of its U.S. brands Popsicle, Klondike, Slim Fast ice cream, Breyers, Starbucks and Ben & Jerry's, the bulk of the company's ice cream business falls under its "Heartbrand" brand umbrella, so called because of the brand's heart-shaped logo. 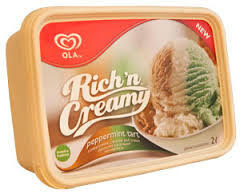 Unilever currently operates eleven ice cream factories in Europe; the biggest include factories at Hellendoorn in The Netherlands, Heppenheim in Germany, Caivano in Italy, St. Dizier in France, Gloucester in the United Kingdom and Santa Iria de Azóia in Portugal.